Many immigrants started their new life in America in tenement housing. Is “tenement” just another word for “apartment”? 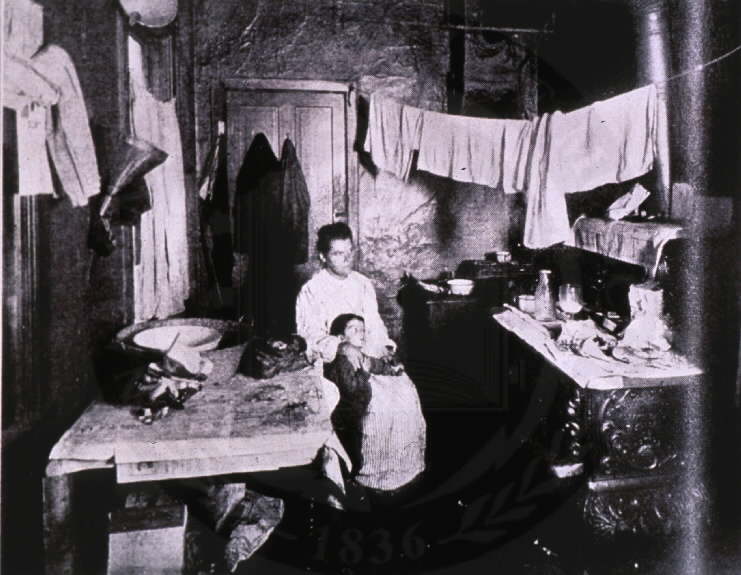 Through online stories and photographs, students will explore what daily life was like for the millions of poor Irish, German, Jewish, and Italian immigrants living in crowded, dirty, dark, unheated, and dangerous tenement apartments at the turn of the century. Despite the harsh tenement life, most immigrants recognized the freedom and opportunity America had to offer and settled into their new lives here, creating a mosaic of rich and varied languages, religions, and cultures and making the best of their situation. Teacher should have background knowledge about tenement life. Students should have some background knowledge about immigrants of the 19th and early 20th centuries. 2. Compare modern apartments with tenement buildings. Draw on students’ prior knowledge about apartments and their growing knowledge of tenement buildings to discuss the similarities and differences between the two. List the differences and similarities on chart paper. 3. Have students visit WNET's Web site on the Lower East Side Tenement Museum. Click on the "Urban Log Cabin" section to view the building located at 97 Orchard Street, New York City. There are two views of the building, one from 1870 and the other from 1915. By clicking on different floors of the building, you and the students can view the different families that lived there. After exploring the site together, give the students the questions sheet of the Tenement Family Questions and Answers Worksheet located within the Resource Carousel. (Note: the second page of this handout contains the answer key.) This worksheet can be worked on as a group, in pairs, individually, or as a homework assignment. There are a variety of questions that students can answer by looking at and clicking on the building interiors. The Tenement As History And Housing: 97 Orchard Street Give the students the Hidden Floorboard Object Questions and Answers worksheet located within the Resource Carousel to describe the ten objects found under the floorboards at 97 Orchard street. (Note: The second page of this handout contains the answer key). 3. Have students fill out Venn Diagram Handout located within the Resource Carousel, comparing and contrasting their home to a tenement apartment. Students can use the chart from Step 1 as well as the things they’ve learned in this step. Have students share their ideas. 4. Divide the class into groups and provide each group with at least two different pictures of tenement scenes. Have students choose a picture and write a diary entry from the point of view of an immigrant seen in the photo, using the My Tenement Life Handout located within the Resource Carousel. Ask students to include at least five details concerning tenement living that they have learned about and their feelings about their living conditions. 5. Have students share their journal entries with the class. Allow students to ask the presenter questions based on the journal entry. Have the presenter respond as "the immigrant." A building that has 4-6 stories. A number of families or tenants living together. Each apartment has 3 rooms (the living or front room, the kitchen, and a small bedroom). Dimensions of the rooms are as follows: living room is 11' x 12' 6", bedroom is 8' 6" square, and the kitchen is 12' x 10' square. 2. Use masking tape on the floor to mark out the dimensions of the typical rooms. Ask 7 or 8 students to step into the space, to help students grasp the crowding. 3. Divide students into groups to build tenement house models. Using the list of characteristics developed by the class, each group should create an apartment inside shoeboxes with the cardboard of cereal boxes for interior walls. Each team should receive a variety of materials in which to create their apartment. 1. Have each group explain their model and how it recreates a tenement apartment in the early part of the 20th century. After the teams have finished creating their apartments, they can stack the apartments on top of each other to create a tenement building. 2. Attach the journal entries to the model building for a display on tenement houses. Journal entries could also be posted to a bulletin board behind the model. 1. If students haven’t already discovered it, point out the "panoramic movie," "Tenement VR," on WNET's Lower East Side Tenement Museum site. By grabbing and moving the picture, students can explore two of the apartments visually. 2. Create a tenement mural. Give each group of students a three-foot long piece of butcher paper and have them draw four large square windows across it. The mural will show an apartment from the outside. In each window, students can write about and draw an aspect of tenement life that they learned about. They should decide how many people live there, what the plumbing is like, details of the sleeping and eating arrangements, etc. When completed, the windows will tell a story about the tenement life of a particular family. After the students finish, make paper shutters so that visitors have to open them in order to learn about the tenements. Put the paper “apartments” on top of one another to create a tenement building to be displayed in the school hallway. Bode, Janet. New Kids in Town: Oral Histories of Immigrant Teens. New York: Scholastic Inc., 1991. Fassler, David, Coming to America: The Kids' Book about Immigration. Burlington, Vermont: Waterfront Books, 1992. Freedman, Russell, Immigrant Kids. New York: Penguin Putnam Books for Young Readers, 1995.